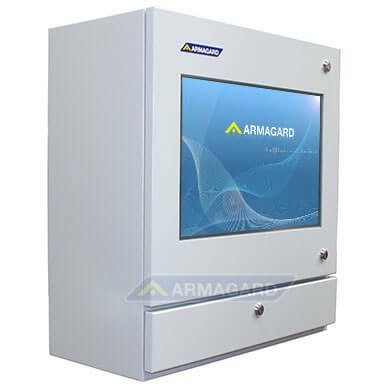 Shop floor touch screen | Protective touch screen computer enclosure for hazardous conditions | Armagard Ltd. 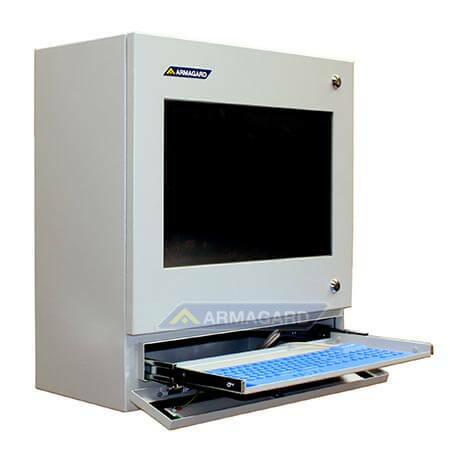 The shop floor touch screen enclosure protects computers in manufacturing environments. The integrated 24" resistive touch screen works through gloved hands (including cut-resistant gloves), improving workflow in locations where the use of a conventional keyboard isn’t viable. The PENC-550 is an ideal workstation in factories, warehouses and industrial environments. 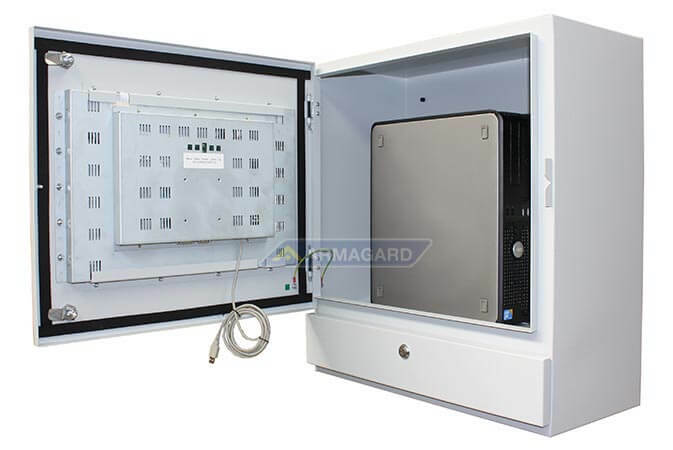 The IP54 mild-steel enclosure protects computers from dust, splashes and physical impact, reducing the risk of downtime and allowing you to boost production efficiency by using PCs in hazardous locations. 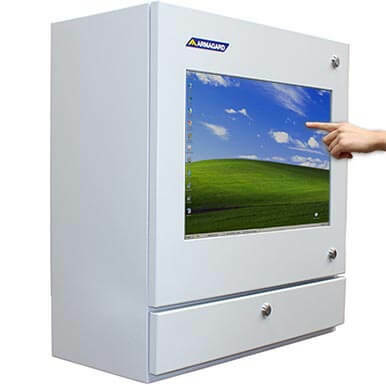 With an expected lifespan of up to a decade, the shop floor touch screen enclosure can protect several generations of computer, delivering an excellent ROI. Optional keyboard shelf, keyboard drawer or IP54 integrated keyboard with touch pad. Create the most optimised set up for your needs. Choose from wall, stand or worktop mounting, and an optional keyboard shelf, keyboard drawer or IP54 integrated keyboard with touch pad. 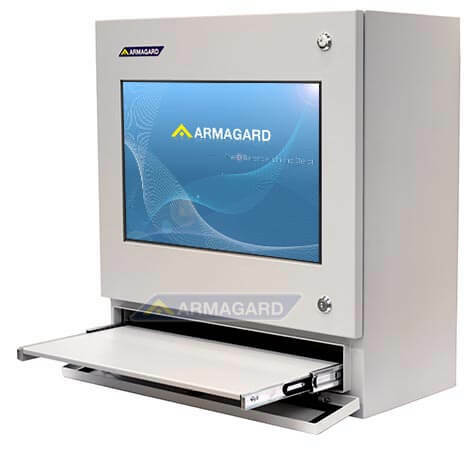 The industrial all-in-one PC touch screen features two key operated locks to prevent unauthorised access, giving you peace of mind about the security of your investment in any location. Integrated 24" resistive touch screen By working through gloved hands, the industrial touch screen provides your employees with an uninterrupted workflow, boosting productivity. Robust powder-coated mild steel body Sealed to IP54, the shop floor touch screen enclosure ensures the PC and screen are fully protected. You benefit from reduced downtime and greater systems protection. Fits thin client and small form factor PCs Enjoy complete hardware flexibility. Use the computer of your choice, guaranteeing compatibility with your existing systems. Easily access the computer at any time, with greater convenience than an industrial panel PC. Water repellent seals Easily clean the shop floor enclosure without risk to the enclosed computer. Seals prevent liquid ingress through the door, locks and window. 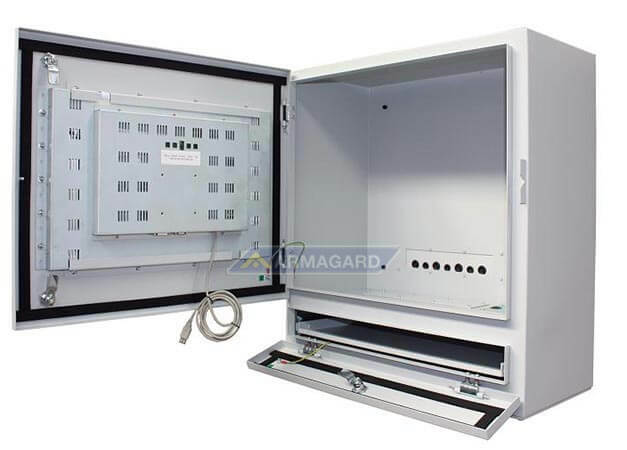 Surge protected four-way mains distribution The computer and monitor are protected from electrical spikes, ensuring the longevity of components. Internal fan Vents and a fan maintain a stable internal temperature. The shop floor touch screen operates with increased uptime, even in hot and dusty environments. Wall, stand or worktop mounting Create the most optimised workstation for your employees. Choose from wall, stand or worktop mounting. Custom keyboard options Add keyboard functionality with an optional keyboard shelf, a lockable keyboard drawer or an IP54 integrated keyboard with touch pad.